Global nuclear security arrangements remain a patchwork of largely voluntary measures and recommendations that are inadequate given the catastrophic consequences of a successful act of ncuclear terrorism. Lack of knowledge is not an impediment to nuclear terrorism. Lack of nuclear material is. Information on how to manipulate nuclear material to produce an explosive device—an improvised nuclear device, which would produce a nuclear explosion and a mushroom cloud, or a radiation-dispersal device, which would spread dangerous radioactive material over a substantial area—is now available widely enough that the only way to prevent nuclear terrorism is to keep terrorists from acquiring nuclear material or getting access to nuclear facilities. An effective international convention on nuclear security is needed to address gaps in global nuclear security arrangements and build a credible global nuclear security regime. The 2016 entry into force of the 2005 amendment to the 1979 Convention on the Physical Protection of Nuclear Material fills a gap in the convention, but the amended convention is far from being the nuclear security convention with common binding standards and a strong review mechanism that is needed. Nonetheless, it can be a useful step toward more effective and comprehensive governance in this field, if states-parties and the International Atomic Energy Agency (IAEA) make better use of it than they did the 1979 convention. The purpose of the original convention was to enhance global nuclear security practices to support the peaceful uses of nuclear energy and prevent illicit acquisition and use of nuclear and other radioactive material,1 but its principal focus was on the security of nuclear material while being transported internationally, although it also addressed domestic transit and storage. It also established measures related to the prevention, detection, and punishment of offenses relating to nuclear material. Global nuclear security arrangements, despite the entry into force of the newly amended convention, remain a patchwork of largely voluntary measures and recommendations that are inadequate given the catastrophic consequences of a successful act of nuclear terrorism. The essential elements of an effective and sustainable global nuclear security regime to prevent nuclear terrorism are still missing. Current international nuclear security arrangements, for example, have no obligatory international process to assess how states are meeting their responsibility to secure these dangerous materials. Perhaps most importantly, there is no mechanism to provide a sustained review and promotion of necessary improvements in the nuclear security regime as a whole. Many assume the IAEA performs these functions, but its role is limited by the lack of a legal mandate to offer more than advice. The amended convention creates an opportunity to develop a sustainable forum for the international community to address some of the existing gaps in global nuclear security arrangements in order to prevent acts of nuclear terrorism. The four nuclear security summits held between 2010 and 2016 provided high-level attention to nuclear security issues that led to a variety of political commitments and voluntary unilateral actions to improve nuclear security practices in states and regions. With this summit process having run its course, however, the time is right for states-parties to the amended convention to develop its heretofore essentially unused review process as a mechanism to regularly and methodically identify, assess, and address gaps in global nuclear security arrangements that could be exploited by terrorist groups and others desiring to use nuclear materials for illicit purposes. Nuclear terrorism remains a continuing threat to global security, stability and prosperity. Heads of state and government at the nuclear security summits stressed the reality of the threat, and past and present IAEA directors-general and national experts have made the same point at meetings and conferences sponsored by the IAEA. Various terrorist groups have signaled an ambition to create mass casualties and disrupt the global order and economy, and the IAEA has documented some 2,500 cases involving the theft, loss of control, unauthorized possession, or illicit trafficking of nuclear and other radioactive material.3 For example, al Qaeda, which is rebuilding, has shown such interest and repeatedly demonstrated its ruthlessness in pursuit of its goals. Similarly, attacks in Europe and elsewhere sponsored and inspired by the Islamic State group over the last 18 months demonstrate that organization’s reach, capability, and determination to create as much damage and chaos as possible, even as it loses territory in Syria and Iraq. Additionally, some nuclear power newcomer states are located in regions with political and security challenges, which will complicate efforts to sustainably secure their nuclear material. The growth of nuclear power and the increased amounts of associated nuclear material are already promoting the development of innovative nuclear technologies and practices that may have an impact on how nuclear material and nuclear facilities that contain it have to be secured and checked. The emerging evolution in nuclear users, technologies, and practices must be factored into the development of a global nuclear security regime in a timely way, not after delays of years or decades or after the wake-up call of a serious nuclear security incident. The increasing amounts of nuclear material outside the IAEA safeguards regime is a further source of concern. Some states with such nuclear materials have demonstrated a commitment to good nuclear security practices, but others have not. North Korea, for example, has a track record of irresponsible behavior, including engaging in illicit activities to supplement the regime’s financial resources. The behavior of such states puts a premium on the need for all other states to collaborate in sharing information about illicit nuclear activity and preventing the illicit transshipment of nuclear material that could be used by terrorist groups. Although states-parties to the original convention may have been committed and active in meeting their national obligations, the treaty’s review mechanism, which was established to allow states-parties to discuss and assess treaty implementation issues, has been essentially dormant. The first and only such meeting to review the treaty was held in 1992.5 There were subsequent meetings of experts to discuss the need for amending the treaty and then negotiating the amendment that entered into force in 2016, but there have been no other meetings of states-parties to review the treaty’s implementation. A successful nuclear terrorism attack would have the potential to destabilize not just a city but also a nation and possibly the global economy, with incalculable human and financial costs. As a result, the international community needs to do all it can to prevent such an event because no response could undo the damage done. Existing international anti-terrorism conventions, including on nuclear terrorism, mainly focus on what to do after an attack. Yet, preventing a dynamic threat involving sophisticated technologies and determined terrorist groups requires an equally dynamic process, not a static or reactive approach and certainly not a moribund one. Global nuclear security arrangements, therefore, need to be subject to regular review and improvement to ensure they are attuned to evolving threats, technologies, and industrial practices. IAEA meetings and conferences on nuclear security and nuclear terrorism, as well as the nuclear security summit process, have begun to bring a dynamism that had been lacking in global nuclear security arrangements, but it is imperative that states-parties use the amended convention to sustain and further develop these nascent efforts. Some states expressed concern that the nuclear security summit process would undercut efforts to bring the amended convention into force and that the summits or some outgrowth of them would supplant the IAEA’s role on nuclear security. Neither concern was realized. Instead, the summit process facilitated the amended convention ratification process, which allowed it to enter into force in 2016, and positioned the IAEA to play a stronger role on nuclear security. The IAEA and states that place a priority on preventing nuclear terrorism need to take steps now to ensure that the review process of the amended convention is more robust and substantive than the essentially non-existent review process of the original convention. This could be done in several ways. One approach would be to hold a review conference before 2021. Article 16 obliges the IAEA to convene the first review conference after five years, but it does not prevent it from doing so earlier. If the agency and a majority of the states-parties to the amended convention saw a need for and supported it, there is no decisive legal argument against holding a review conference sooner. Such an initiative could be started by the IAEA in its capacity as the convention depositary or by a group of states, such as those that signed the Joint Statement for Strengthening Nuclear Security Implementation, adopted at the 2014 Hague nuclear security summit and subsequently converted into IAEA document INFCIRC/869. IAEA consultations with and among Vienna-based IAEA delegations would be a practical way to facilitate a process of building support for an earlier review conference, which could be held in 2019 or 2020. Undoubtedly, there would be resistance to this idea from at least some states-parties, citing, for example, the need for more time to implement the amended convention and the challenge of finding sufficient resources for it, nationally and in the IAEA. As a result, holding a review conference before 2021 would require active championing by the IAEA and leading states-parties. Another approach that might draw broader and more immediate support would involve developing a preparatory meetings process, similar to the NPT approach. If the current Article 16 interval remains at least five years, it is vital that states-parties meet regularly between the review conferences to prepare the conferences and, equally importantly, to have opportunities for discussion of current issues affecting the convention and its implementation. More generally, the establishment of a forum that meets regularly and fairly frequently is essential to support momentum in improving nuclear security. Preparatory meetings will be especially important to lay the groundwork for the first review conference, if it is not held until 2021. There are a variety of questions, procedural and substantive, to be addressed to ensure that the first review conference of the amended convention produces a sustainable process to steadily assess and improve global nuclear security. Ideally, there would be two preparatory meetings, one in 2019 and one late in 2020 or early in 2021. The convention has no provision on intersessional or preparatory meetings ahead of the review conferences, but this does not preclude such meetings under international law. Yet, care would have to be taken in developing political support to initiate a process of preparatory meetings. The IAEA director-general could ask a representative group of states-parties to consult with him on what preparations would be needed for the first review conference to ensure its success. This informal consultation process could lead to a more formal set of preparatory meetings leading up to the first review conference. Alternatively, a group of states-parties, for example those that have signed on to IAEA INFCIRC/869, could urge the IAEA director-general to formally convene a meeting or a series of meetings to prepare for the first review conference of the amended convention. Regardless of how it is done, establishing a preparatory process for review conferences held no more often than every five years will be essential for the review conferences to be effective in strengthening nuclear security and preventing nuclear terrorism. Preparatory meetings and review conferences are only as good as their objectives and agendas. Article 16 provides a traditional and minimalistic description of the objective of the review conference, that is, it shall review the implementation of the entirety of the convention and its adequacy in light of the prevailing situation. It provides no guidance on how to fulfill the task, including no reference to the possibility of going beyond an article-by-article implementation review. The reporting system could become even stronger and more useful if it were supplemented by self-assessment and peer review mechanisms, the results of which would be included in the reports, while respecting the need to protect any sensitive information from disclosure. Although treaty review conferences generally focus on a review of the implementation matters, some, such as the Montreal Protocol on Substances That Deplete the Ozone Layer, are more dynamic. The protocol review conferences examine and make decisions to respond to the impact on treaty obligations of new scientific information. The IAEA and states-parties should be similarly dynamic in establishing a broader mandate and a more dynamic role for the amended convention’s review conferences and preparatory process, for example by conducting assessments of the international nuclear security regime in general with a view to improve and develop it or by examining how changes in nuclear power technologies and industrial practices affect states-parties’ convention obligations. This could lead to identification of gaps and proposals for how to address them. Article 16 does not specifically deal with this question, but it does mention that a review of “the adequacy” of the convention is part of the objectives of the review conference, and likewise, the article concludes that the review is performed “in the light of the then prevailing situation.” There is, therefore, scope for an interpretation of Article 16 that leaves the door open for the amended convention’s review conferences to have a dynamic character, including assessing the accord’s effectiveness in meeting its goals, identifying gaps in the global nuclear security regime, and considering how to address them. Additionally, such an approach to the review conference’s agenda would generally be in line with the spirit of IAEA INFCIRC/869. States-parties that have signed on to INFCIRC/869 should take the lead in promoting this approach in order to strengthen and supplement the effectiveness of commitments already made. In any event, a good case can be made that the convention’s lack of specificity on the review process means the states-parties are free to shape the agenda of the review conferences according to their wishes and needs in light of prevailing circumstances. Because the IAEA convenes the review conferences, it is also authorized to make proposals concerning the preparation of a conference, including details about the number and duration of preparatory meetings, as well as the question of who may participate in them (e.g., whether states parties to the original convention and the amended one or only the latter should be allowed to participate). In that connection, it will also have to be considered and decided to what extent and in which capacity civil society and the nuclear industry can participate in the review conferences. One of the experiences from the nuclear security summit process was that the parallel industry and knowledge (civil society experts) summits offered valuable contributions to the official meetings and the overall goal of improving nuclear security. There were similarly positive experiences with the participation of nongovernmental representatives at the IAEA nuclear security conferences in 2013 and 2016. Industry and civil society have important roles to play in supporting and promoting effective nuclear security practices, so it would be appropriate to adopt rules that facilitate their participation in the convention’s review conferences. The Convention on the Physical Protection of Nuclear Material was negotiated in 1979 and entered into force in 1987. The amendment to the convention was negotiated in 2005 and entered into force in 2016. There have been a variety of developments related to the security of nuclear materials since 1979. Other international agreements related to nuclear security and terrorism, such as the International Convention for the Suppression of Acts of Nuclear Terrorism and UN Security Council Resolutions 1373, 1540, and 1887, have been adopted; and a variety of like-minded state initiatives, such as the Global Initiative to Combat Nuclear Terrorism and the nuclear security summit process, emerged to promote political commitments and voluntary action. Yet from 1987 to the present, there has been only one implementation review conference for the states-parties of the one international agreement related to securing nuclear materials from those who would seek to illicitly acquire, traffic in, or use it. With the amended convention now in force, it is time for the states-parties and the IAEA to pick up where the nuclear security summit process left off and move the global nuclear security agenda forward. The review mechanism of the treaty provides an opportunity and scope for continuing efforts to do so. 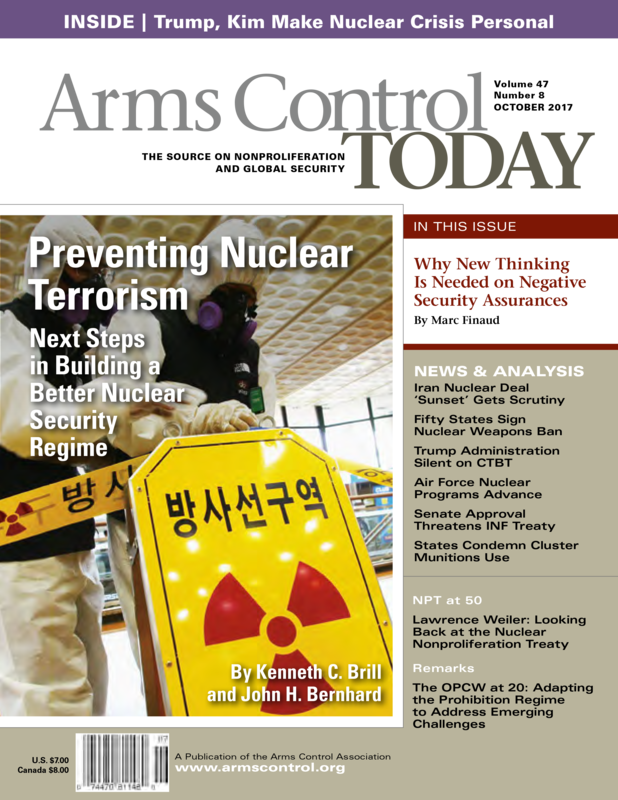 Given the disappointing record of the original convention’s review mechanism, states-parties and the IAEA will need to provide strong and coordinated leadership and pursue an ambitious interpretation of the amended convention’s review process to identify and address gaps in nuclear security arrangements and, in so doing, contribute to preventing a catastrophic act of nuclear terrorism. 1. Convention on the Physical Protection of Nuclear Material, October 26, 1979, 1456 U.N.T.S. 124. 2. Amendment to the Convention on the Physical Protection of Nuclear Material, July 8, 2005, https://treaties.un.org/doc/Publication/UNTS/No%20Volume/24631/A-24631-0800000280478876.pdf. 3. International Atomic Energy Agency (IAEA), “Incident and Trafficking Database,” December 9, 2014, http://www-ns.iaea.org/security/itdb.asp. 4.&espn;In two statements in June 2017, IAEA Director-General Yukiya Amano noted the rapid growth in the number of new nuclear power plants, with the expansion mostly ;taking place in Asia but with developing countries, including in Africa, also embarking on nuclear power programs, https://www.iaea.org/newscenter/statements/opening-remarks-at-international-conference-on-topical-issues-in-nuclear-installation-safety-safety-demonstration-of-advanced-water-cooled-nuclear-power-plants. 5. Jonathan Herbach, “Reinforcing the Three Pillars: How Nuclear Security Efforts Underwrite the Strength of the Non-Proliferation Regime” (paper, Nuclear Disarmament, Non-Proliferation, and Energy: Fresh Ideas for the Future symposium, April 28, 2015), p. 11, http://www.belfercenter.org/sites/default/files/legacy/files/JDHerbach.pdf. 6. IAEA, “Convention on Nuclear Safety: Seventh Review Meeting,” July 14, 2017 http://www-ns.iaea.org/conventions/nuclear-safety.asp. 7. 1995 Review and Extension Conference of the Parties to the Treaty on the Non-Proliferation of Nuclear Weapons, ”Strengthening the Review Process for the Treaty,” n.d., para. 3, https://unoda-web.s3-accelerate.amazonaws.com/wp-content/uploads/assets/WMD/Nuclear/1995-NPT/pdf/1995-NY-NPTReviewConference-FinalDocumentDecision_I.pdf. 8. For a description of annual meetings and changes made to the Montreal Protocol on Substances That Deplete the Ozone Layer since it entered into force, see UN Environment Programme, “The Montreal Protocol on Substances That Deplete the Ozone Layer,” n.d., http://ozone.unep.org/en/treaties-and-decisions/montreal-protocol-substances-deplete-ozone-layer (accessed September 14, 2017). 9. IAEA Board of Governors and IAEA General Conference, “Nuclear Security - Measures to Protect Against Nuclear Terrorism: Amendment to the Convention on the Physical Protection of Nuclear Material; Report by the Director General,” GOV/INF/2005/10-GC(49)/INF/6, September 6, 2005, p. 11. 10. Convention on the Physical Protection of Nuclear Material, art. 14, para 1. 11. Yukiya Amano, statement to the IAEA Board of Governors, June 12, 2017, https://www.iaea.org/newscenter/statements/introductory-statement-to-the-board-of-governors-12-june-2017. Kenneth C. Brill is a former U.S. ambassador to the International Atomic Energy Agency (IAEA) and founding director of the U.S. National Counterproliferation Center. John H. Bernhard is a former Danish ambassador to the IAEA and the Organization for Security and Co-operation in Europe and a former legal adviser in the Danish Foreign Ministry. Caveats linked to chemical and biological weapons use have re-emerged in a manner that may result in a lowering of the threshold for use of nculear weapons. Since the Cold War, nuclear powers have pledged not to use or threaten to use their nuclear weapons against countries that do not possess such weapons. These so-called negative security assurances (NSAs) were intended as incentives (or rewards) for adherence to the nuclear Nonproliferation Treaty (NPT). The individual pledges, however, contained caveats and conditions. One was the exclusion of the assurance toward non-nuclear-weapon states taking part in conventional attacks in alliance with a nuclear-weapon state, such as the typical Cold War scenario of a war between NATO and the Warsaw Pact. Another exclusion logically targeted states not complying with NPT commitments, the states that secretly acquired or manufactured nuclear weapons. Further, there was some ambiguity with regard to deterring attacks with other types of weapons of mass destruction (WMD): chemical or biological weapons. In recent years, the NSA exclusion related to conventional attacks by alliances has been dropped by the Western nuclear powers, given the demise of the Warsaw Pact. Yet, the condition linked to chemical and biological weapons use has re-emerged in a manner that may lead to a weakening of NSAs and result in a worrisome lowering of the threshold for use of nuclear weapons. For this reason, some new thinking on NSAs is needed. The three Western nuclear-weapon states thus have renounced the traditional Cold War condition applying to non-nuclear-weapon states taking part in conventional attacks in alliance with a nuclear-weapon state. This is a realistic and welcome development that takes into account the changed strategic environment and contributes to lowering the risk of nuclear war. In any case, the linkage between nuclear and conventional weapons remains a decisive part of a strong deterrent for Russia. This is not unrelated to its threat perception coming from the United States and NATO, including from anti-ballistic missile systems and long-range, conventional precision-guided weapons. As a result, the risk of nuclear war may have become higher than during the Cold War, as assessed by former U.S. Secretary of Defense William Perry.7 The situation would appear even worse when looking at the other conditions introduced by the nuclear-weapon states into their NSAs—those related to chemical and biological weapons use. This statement considerably weakened the step forward made regarding the Cold War alliance-related condition, despite an attempt to be reassuring by stating, “That does not mean that our willingness to use nuclear weapons against countries not covered by the new assurance has in any way increased.”12 Although the United States officially did not exclude the use of nuclear weapons in a scenario involving a chemical attack by Iraq against U.S. forces during the 1991 Persian Gulf War, in the “redlines” mentioned by Obama in 2006 in case Syria used chemical weapons, there was no reference to nuclear weapons use but also no hypothesis of an attack against U.S. forces or interests. This exception only applies in case of unpredicted developments. Even raised as a flag, however, it weakens the progress made in the new formulation. Moreover, it was unnecessary to state this exception explicitly because any nuclear-weapon state has the right to modify unilaterally its assurance, as shown by the changes made by the United States in 2010. Not in the most far-fetched scenario could chemical attacks endanger the vital interests of nuclear-weapon states and justify the use of nuclear weapons in retaliation. During the Persian Gulf War, France then categorically excluded such a use of nuclear weapons18 while the United States and the UK maintained ambiguity. Since 1995, under Presidents Jacques Chirac and Nicolas Sarkozy, France also has maintained some ambiguity as to possible nuclear retaliation to a chemical or biological attack.19 Now, France explicitly adds noncompliance with the CWC or the BWC, not just chemical or biological attacks, as reasons justifying the use of nuclear weapons. The case of biological weapons could be argued to be different and susceptible to unpredictable developments. Therefore, the United States and the UK reserve the right to review their nuclear posture in case such developments occurred that endangered their vital interests. Here again, even the most pessimistic scenarios of massive use of biological agents—by state or nonstate actors—could hardly be deemed as warranting the use of nuclear weapons. No state currently claims to possess biological weapons because they globally appear as “repugnant to the conscience of mankind,” as stated in the BWC. If such biological weapons were developed and used by state or nonstate actors, how conceivable would it be to identify the source and authors of an attack and target them with nuclear weapons and within what time frame, considering the slow spread of some pathogens? If the nuclear doctrine of nuclear-weapon states understandably includes nonproliferation or even counterproliferation dimensions, establishing linkages between nuclear, conventional, chemical, and biological weapons can lead only to confusion, misunderstandings, or higher risks of nuclear catastrophe. The threshold for use of nuclear weapons is already being lowered by the maintenance of nuclear tactical weapons and the increasing resort to lower-yield warheads or means of delivery, such as cruise missiles, that can be conventional but easily mistaken for nuclear weapons. There is no need for making the situation worse. All nuclear-armed states possess sufficiently powerful conventional military capabilities to handle conventional, chemical, or biological threats against themselves or their allies. Such challenges should be addressed only within existing multilateral frameworks. It is a paradox that the United States included biological threats as a possible reason for reviewing its nuclear posture while remaining, since 2001, opposed to any multilateral verification of the BWC that could help strengthen the international response to the risk of deliberate use of disease as a weapon. In addition, a major hurdle in the condition regarding noncompliance with any nonproliferation commitment, whether in nuclear, chemical, or biological weapons, would be how and by whom such breaches would be determined. The issue of evidence of WMD programs has been a recurring nightmare in the case of Iraq, Iran, Libya, North Korea, and Syria. Even if a legitimate role can be assumed for the UN Security Council, what would happen if one of the permanent members were an ally of a suspected violator, as is currently the case with Russia and Syria? If determination is left to the individual nuclear-weapon state, is this opening the door to unilateral, uncontrollable actions? Moreover, what if a state has not made any “international nonproliferation commitments,” such as Israel, which is not a party to the NPT, the CWC, the BWC, or the Comprehensive Test Ban Treaty? The second major development will be the new five-year review cycle of the NPT, which has opened in May 2017 in Vienna and will culminate with the review conference in New York in 2020. By then, it is likely that the new treaty prohibiting nuclear weapons will have many signatories despite the opposition of the nuclear-weapon states. Some NPT states-parties such as Germany, sharing the goal of a world without nuclear weapons but seeking the participation of the nuclear-weapon states in the negotiation process, can be expected to push for an expansion of existing NSAs as a mediation tool. Few options actually could rally the approval of the nuclear-weapon states and offer sufficient improvements to the non-nuclear-weapon states, at least to make them hesitate before joining the ban treaty, at the same time. As proposed by Germany and a few other Western states at the 2016 UN open-ended working group on multilateral nuclear disarmament,21 one option could be to negotiate a legally binding instrument, as a protocol to the NPT or a separate treaty, limiting the conditions of NSAs to two: a beneficiary “must not be in material breach of the NPT and not attacking a [nuclear-weapon state] while itself acting in consort with another” nuclear-weapon state. The other option for nuclear-weapon states would be to radically shift their nuclear doctrine to the “sole purpose” approach, tasking nuclear weapons only to deter nuclear attacks, thereby reinforcing global stability and the security of states that have foregone nuclear weapons. It would exclude any nuclear response to a conventional, chemical, or biological attack (presumably also a cyberattack). The threshold of use of nuclear weapons would be made more consistent with their historical purpose, and the whole world would obviously feel much safer in the interim period prior to the elimination of all nuclear weapons. 1. UN Office for Disarmament Affairs, “Nuclear-Weapon-Free Zones,” n.d., http://www.un.org/disarmament/wmd/nuclear/nwfz/ (accessed March 7, 2017). 2. U.S. Department of Defense, “Nuclear Posture Review Report,” April 2010, p. viii, https://www.defense.gov/Portals/1/features/defenseReviews/NPR/2010_Nuclear_Posture_Review_Report.pdf (hereinafter NPR Report). 3. “National Security Strategy and Strategic Defence and Security Review 2015,” Cm 9161, November 2015, http://www.gov.uk/government/uploads/system/uploads/attachment_data/file/555607/2015_Strategic_Defence_and_Security_Review.pdf. 4. French Embassy to the United Kingdom, “France Will Not Lower Its Nuclear Guard, Vows President,” March 2, 2015, http://www.ambafrance-uk.org/France-will-not-lower-its-nuclear. 6. See Olga Oliker, “Russia’s Nuclear Doctrine: What We Know, What We Don’t, and What That Means,” Center for Strategic and International Studies, May 2016, http://csis-prod.s3.amazonaws.com/s3fs-public/publication/160504_Oliker_RussiasNuclearDoctrine_Web.pdf. 7. Conn Hallinan, “We May Be at a Greater Risk of Nuclear Catastrophe Than During the Cold War,” Foreign Policy in Focus, July 20, 2016, http://fpif.org/may-greater-risk-nuclear-catastrophe-cold-war/. 8. William M. Arkin, “Secret Plan Outlines the Unthinkable,” Los Angeles Times, March 10, 2002. 9. Arms Control Association, “U.S. ‘Negative Security Assurances’ at a Glance,” September 2012, http://www.armscontrol.org/factsheets/negsec?print. 10. NPR Report, p. 16. 14. “National Security Strategy and Strategic Defence and Security Review 2015,” para. 4.69. 17. States not party to the Biological Weapons Convention are Central African Republic, Chad, Comoros, Djibouti, Egypt, Eritrea, Haiti, Israel, Kiribati, Micronesia, Namibia, Niue, Somalia, South Sudan, Syria, Tanzania, and Tuvalu. States not party to the Chemical Weapons Convention are Egypt, Israel, North Korea, Palestine, and South Sudan. 18. Hans Kristensen and Joshua Handler, “Nuclear Counterproliferation in the Middle East,” Middle East Report, No. 197 (October–November 1995), http://www.merip.org/mer/mer197/nuclear-counterproliferation-middle-east. 20. “India May Abandon ‘No First Use’ Nuclear Policy: Expert,” The Times of India, March 21, 2017. 21. UN General Assembly, “Open-Ended Working Group Taking Forward Multilateral Nuclear Disarmament Negotiations: Security Assurances,” A/AC.286/WP.26, April 21, 2016. Marc Finaud, a former French diplomat, is a senior program adviser at the Geneva Centre for Security Policy. During his diplomatic career, his assignments included missions to the Conference on Security and Cooperation in Europe, the Conference on Disarmament, and the United Nations. Success should not be measured strictly in weapons destroyed but also in weapons prevented from being built. This year marks the 20th anniversary of the entry into force of the Chemical Weapons Convention and the founding of the Organisation for the Prohibition of Chemical Weapons (OPCW). Today, the convention remains the foundation of the international community’s commitment to eliminate the scourge of chemical weapons. Impressive progress has been made in 20 years. More than 95 percent of 72,000 tons of declared chemical warfare agents have been destroyed under the OPCW’s verification. The Russian Federation will complete the destruction of its stockpile before the end of this year and the United States by 2023. In parallel to our achievements, we have faced formidable challenges. In 2013, the OPCW began an unprecedented mission to remove Syria’s chemical weapons. With the support of the United Nations, the European Union, and more than 30 states-parties, 1,300 metric tons of chemical weapons material were removed from Syria and destroyed. This was an impressive achievement. Unfortunately, that did not mark the end of our work in Syria. Amid persistent and credible allegations that chlorine was being used as a chemical weapon, I established a fact-finding mission in April 2014 that has examined a significant number of incidents and substantiated several cases of the use of toxic chemicals as weapons, an incident involving sarin, and another involving sulfur mustard. This behavior flies in the face of every civilized norm and is in direct violation of the convention. Moving forward, our success should not be measured strictly in weapons destroyed but also in weapons prevented from being built. One thing that is very clear: the challenges of tomorrow will be very different from those of yesterday. The continued use of chemical weapons, the mounting threat of chemical terrorism, and the evolution of science and technology are all shaping our future. The threat of chemical terrorism is a real concern and one that cannot be easily addressed with current approaches to nonproliferation. Countering this threat will require action on many fronts using all available tools, including multilateral coordination and legislative means. We take this threat seriously. Our Open-Ended Working Group on Terrorism is tasked with identifying opportunities for enhanced interaction and coordination with relevant international bodies. A sub-working group focuses particular attention on the problem of nonstate actors. We also have an active partnership with the UN Counter-Terrorism Implementation Task Force, which helps us and more than a dozen other international organizations practice and coordinate responses to biological and chemical weapons threats. Together with the International Atomic Energy Agency, the OPCW co-chairs the working group on preventing and responding to weapons of mass destruction terrorist attacks with chemical or biological weapons. On the legal front, ensuring that all our states-parties have effective legal and other regulatory measures in place and supporting internal structures to administer them are critical. These provide the foundation for preventing nonstate actors from gaining access to materials that could aid the development of chemical weapons. Advances in science and technology will be one of the drivers shaping our future as we all work to ensure that such developments are only for the benefit of humankind. This makes it necessary for us to have the ability to detect new chemicals and establish if they are relevant to the convention. Similarly, we need to acquire a deeper understanding of the growing interaction between chemistry and biology, which also gives rise to the ability to produce potentially dangerous chemicals through new techniques and methods. Advancements in chemistry cannot, of course, be constrained. But it is imperative to monitor them closely to utilize them for improving verification and protection measures. In a world that sometimes finds it difficult to reach a common ground on crucial issues, the convention and the work of the OPCW demonstrate what can be achieved if we remain steadfast in supporting global norms for the common good. U.S. officials make misleading statements critical of the accord's duration. UN Secretary-General António Guterres herals the treaty as a "milestone," even as nuclear powers remain opposed. The day after President Donald Trump used his first address to the UN General Assembly to denounce the Iran nuclear deal and to threaten to “totally destroy” North Korea, 50 countries signed a landmark treaty prohibiting nuclear weapons. “We welcome the treaty as a long-awaited and essential step towards [nuclear weapons] elimination, and we do so foremost with the victims of these weapons in mind—those who died following the Hiroshima and Nagasaki bombings, after later nuclear testing, and those who still suffer today,” International Committee of the Red Cross President Peter Maurer declared at the ceremony. Beatrice Fihn, executive director of the International Campaign to Abolish Nuclear Weapons, emphasized the role of nuclear weapons survivors from Japan in pressing for the treaty. Nuclear-armed states and NATO members strongly oppose the treaty. French Foreign Minister Jean-Yves Le Drian on Sept. 18 called the treaty “close to irresponsible” and said that it could undermine the nuclear Nonproliferation Treaty. U.S. Defense Secretary Jim Mattis warned Swedish Defense Minister Peter Hultqvist in a letter that signing the treaty could hurt U.S.-Swedish military cooperation and U.S. military support in the event of war, according to the Swedish newspaper Svenska Dagbladet. Calls to sign the treaty stretched beyond the UN complex in New York. On Sept. 20, two activists in Australia scaled the roof of a foreign ministry building in the capital, Canberra, and unfurled a banner urging their government to sign the nuclear ban treaty. The United States withholds comment while the new administration reviews nuclear weapons policies. The U.S. Air Force in August awarded roughly $2.5 billion in contracts to four major defense companies to continue the initial development of new fleets of air-launched cruise missiles (ALCMs) and intercontinental ballistic missiles (ICBMs). The contracts come as the Trump administration continues to conduct a comprehensive review of U.S. nuclear weapons policy and Defense Secretary Jim Mattis has yet to endorse the new ALCM program, known as the long-range standoff weapon. A Congressional Budget Office (CBO) report in February estimated that the United States will spend $400 billion on nuclear weapons during fiscal years 2017 to 2026. (See ACT, March 2017.) That is an increase of $52 billion, or 15 percent, from the CBO’s previous 10-year estimate of $348 billion, which was published in January 2015. The budget office’s latest projection suggests that the cost of nuclear forces could far exceed $1 trillion over the next 30 years. It remains to be seen whether the administration’s Nuclear Posture Review will make changes to the Obama administration’s nuclear upgrade plans. The review is slated for completion later this year. The Air Force awarded two $900 million contracts to Lockheed Martin Corp. and Raytheon Co. “to mature design concepts and prove developmental technologies” for the new cruise missile, according to an Aug. 21 service press release. The contracts cover a 54-month period of development after which the Air Force will choose one of the contractors to complete development and begin production. The Air Force is developing the long-range standoff weapon to replace the existing ALCM. The service says a new ALCM is needed because the existing missiles are becoming increasingly difficult to maintain and losing their ability to penetrate sophisticated air defenses. The new missile will be compatible with the B-2 and B-52H bombers, as well as the planned B-21. The Air Force selected Boeing Co. and Northrop Grumman Systems Corp. to proceed with development of the Minuteman III replacement, known as the Ground-Based Strategic Deterrent (GBSD) system. The contracts are “valued at no more than $359 million each” and cover of period of approximately 36 months, according to an Aug. 21 service press release. The Air Force argues that a new ICBM is necessary because the Minuteman III, which is slated for retirement beginning in 2030, is becoming too expensive to maintain. But some analysts claim that the life of the Minuteman III can be extended at less cost than buying new missiles. But some analysts claim that there could be more cost-effective alternatives to buying new missiles.